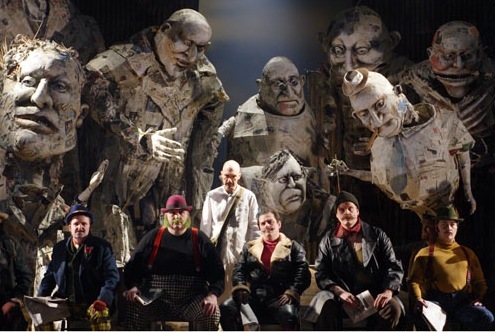 On Saturday I enjoyed one of the highlights of my opera going life at the flawless production of the Phillip Glass opera Satyagraha, directed by Phelim McDermott. Based on the life of Ghandi, with illuminating reference to the lifelong struggle of fellow titan Martin Luther King, the performance achieved moments of extraordinary beauty. This being a Phillip Glass work it was also ponderous, aching, celebratory, stirring and at times - yes - seriously dull. Glass reminds you what is unique about the opera's capacity to transport, because it's at once sublime and physical, heard and seen, and no other medium marries the elusive magic of music to the spectacles of the physical world with the same capacity for rapture. Which is just a highfalutin way of saying I loved it. Meanwhile we're at an unusual moment in the history of this nation, where the gulf between - to borrow a little opera parlance - standing room and orchestra prime have become dangerously pronounced. Lincoln Center was recently remodeled after a $100M gift from oil baron and Tea Party funder David Koch. But it's doubtful he ever envisaged it beging the scene of an impassioned discussion between audience members and protestors, as they debated issues of exploitation and civil rights (which, marvellously, are also the subject of Satyagraha itself) on the opera house steps. If you can get tickets to see Satyagraha I can assure you you'll be glad you did.